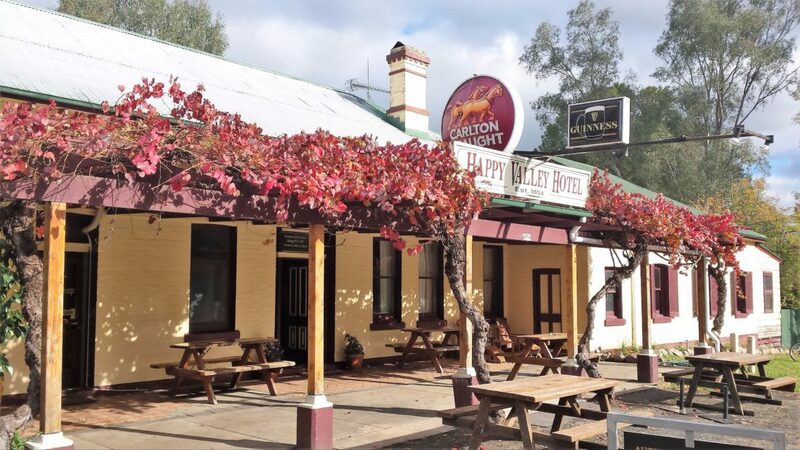 The Happy Valley Hotel is a welcoming country pub with a great reputation for food and fun. Promising a great range of beers on tap, fantastic coffee and a wine list comprising of mainly locally produced wines from the Alpine area. The Hotel’s history dates back to 1854 when the liquor licence was first granted in now sitting in the building completed in 1880’s. Relax in the undercover beer garden, two lovely dining rooms or enjoy the outdoor seating under the vines covering the front veranda. The Hotel backs onto the Murray to Mountains Rail Trail and have bike racks available for guests. Providing for locals and travelers alike for over 160 years, you can find the Hotel on the Great Alpine Road just past Myrtleford on the way to Bright. Be sure to drop in and say hello.